"The whole city is talking. You wanna know what they're talking about? Us!" I�m not sure at what point the vampire hero became far more prevalent than the vampire bad guy. Somewhere between Nosferatu and Wesley Snipes� Blade, vampires became badass crime fighters. Certainly Anne Rice brought us thoroughly sympathetic vampires, but we�ve since seen an entire genre of films and TV shows built around the friendly vampire premise. There�s even a bit of a sub-genre in which Moonlight securely sits: the vampire police drama. The show�s hero, Mick St. John, isn�t a cop like Nick Knight from Forever Knight, he�s a private investigator like Angel. Same idea, though: this vampire�s on our side. Unfortunately, ratings were not on Mick's side. Despite a People's Choice Award for Favorite New Drama, Moonlight fell victim to the pitiless writer's strike which left nothing but TV-devastation in its wake. 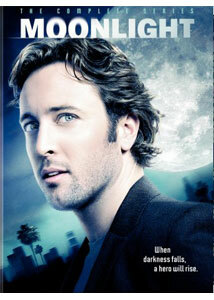 The relatively young Mick (Alex O�Loughlin, late of The Shield) keeps an eye out for crimes that have hints of the vampiric. As a blood-sucker who eats almost exclusively from the blood bank, only occasionally feeding on exceptionally bad guys, Mick has taken it upon himself to protect southern California from vampires who can�t keep it in their pants, for lack of a less tacky euphemism (why so many vampires would live in one of the sunniest parts of the country is beyond me, unless perhaps the persistent smog mitigates the threat). Discrete vampires don�t seem to be much of a problem, but Mick definitely takes an interest in those who draw attention to themselves. Apparently the business is good: his stunningly spacious apartment would easily run into the millions in non-fictional Los Angeles. A very public murder in the pilot brings him to the attention of a tabloid reporter (Sophia Myles) who doesn�t take too long figuring out that there are things about Mick that just don�t add up. The pictures of an identical guy, with the same name, from the '50s, for instance? Weird. There�s also Mick�s nasty ex-wife, who made Mick a vampire on their wedding night, and has a connection with the same tabloid reporter. Mick tied her up and set her on fire fifteen years ago, but it naturally turns out that it�s not quite as easy to kill a dead lady as Mick might have thought. In spite of the dark subject matter, it�s a fairly typical network show in many respects. Everything is exceptionally clean and pretty, the violence is minimal, and there�s pretty much no gore, in spite of the presence of various bloodthirsty vampires, some good, some bad. The show takes a few different turns on the mythology of vampires, most for the sake of convenience (showing up in the daylight doesn�t kill these guys, it just makes them exceptionally tired). The one innovation that I appreciated was the matter-of-factness with which our vampire hero approaches his fellow blood-suckers. It�s certainly not the first movie or show about a sympathetic, even heroic vampire, one who conscientiously avoids human blood (see the spectacular Angel, HBO�s True Blood, and the recent Twilight, to name a few) but it is a rare one where the hero more-or-less gets along with the non-vegetarians. Mick�s best friend, played by Veronica Mars� Jason Dohring, has very little interest in humans as anything other than snacks. It�s a dark sideline that the hero deals with the proclivities of his friends matter-of-factly rather than with disgust. The show never really deals with that, but it could have provided some real heft later on. On the whole, there�s not much here that�s more than merely diverting. The acting is acceptable, even if the chemistry between the leads is minimal (I never found myself caring if they got together, even though we were clearly meant to). I understand the show�s devoted, though small, following to a point: it�s brisk and light, if sometimes silly. The stakes are never too high, the stress factor never too great. Season-long romantic subplot aside, as well as recurring visits from Mick�s ex-wife, the episodes more-or-less stand alone, and they move along briskly enough. Given the hours of great-to-brilliant TV that we�ve seen over the past few years, I�m not sure I could entirely justify spending the time on Moonlight. There�s also plenty of TV drama, though, that merely wants to be great and winds up succeeding only in being pretentious and ponderous. This one is neither: it�s light, modestly enjoyable, mostly forgettable. But then, it doesn�t all need to be Shakespeare. Image Transfer Review: Spotty. The show has a very slick look and camera-style, which only makes some of the transfer issues more glaring. There's a good deal of aliasing (wavy lines and distortions brought about by improper sampling) visible throughout. The overall look suffers as a result, although these aren't usually glaring problems. On the plus side, colors are rich and the image is otherwise crisp. Audio Transfer Review: The Dolby 5.1 mix is impressively full and rich. The music and action scenes come through beautifully, while never overpowering the dialogue. It's quite a nice mix. Extras Review: While there is a nice, glossy, six-page fold-out booklet with pictures and episode descriptions, there are no digital features at all. I can't say I'm nearly as disappointed by Moonlight's cancellation as the show's passionate fans, but I did generally enjoy myself. While those fans should be happy to have the full run available on DVD, they'll doubtless be disappointed by the lack of extras. The series is mostly forgettable, but consistently fulfills its modest ambitions and manages a certain level of fun with a game, likeable cast and one-off stories that move along briskly. Don't expect too much, and it's not a bad way to spend an hour.